Just in case you didn’t know ~ NEVER wash a chenille blanket with anything else!! Especially black pants! The sad thing is is I know better and still did it. 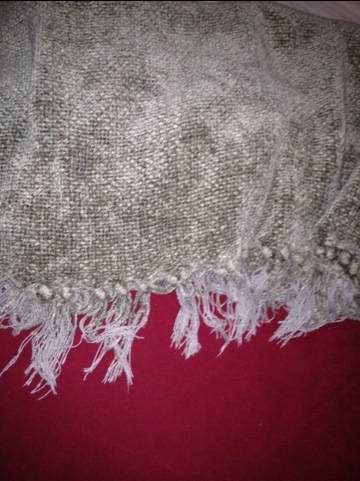 I washed a green chenille blanket with a maroon micro-fiber blanket and then with a pair of black capris. The black capris came out looking like camouflage pants!! There was so much green fuzz on them I could have made a sweater. Why is it we do stuff that we KNOW is not right but still do it? I do not understand what I do. For what I want to do I do not do, but what I hate I do…I have the desire to do what is good, but I cannot carry it out. This applies to all aspects of my life; not just the laundry. When I do something I shouldn’t, eventually I end up having “green fuzz” clinging to me. Today I’m taking a serious look at what I need to de-fuzz out of my life. What is “fuzzy” in your life? P.S. I titled this ‘Lesson Learned!’ ~ my question is…why do I have to keep repeating the same mistakes…when will I really LEARN?? We all need to defuzz.